Not too much going on lately, but work. Luckily, this is a short week since we will be having a holiday on Thursday. We also get Friday off, but have to work on Sunday. A three-day weekend will be nice. I have not decided yet what I am going to do during the holiday weekend. I had thought of flying off some place like Manila or Singapore, but there's a lot of things to see in ChengDu that I haven't seen so I think I'll do that. The weather here is nce too, so that will be good. I found this mini-series that came out on HBO about John Adams, and have been watching some of that when I have time. I've only seen the first five episodes (of a total of seven), and I think it's really good! I am still kind of curious why they did the series about John Adams. I would think a mini-series about some of the other founding fathers; such as George Washington, Benjamin Franklin, Thomas Jefferson, etc... would have been more exciting. Maybe that's the reason they chose John Adams, since his story is as much about the birth of the United States as much as about him. The lives of the others would probably overshadow the story about the birth of the nation. Anyways, it is nice to see something about that period of time, especially since our entertainment industry seems to neglect stories from that time. Maybe if we're lucky they'll do more shows about the American revolution and about the other founding fathers. 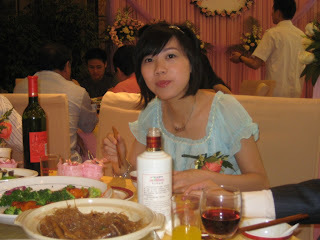 The wedding party was held at a restaurant downtown called 广阔天地. I was greeted by the couple outside of the restaurant, and after signing the guest book I was offered candy and a cigarette that were spread out on some nice ornate trays. After entering the restaurant I was escorted upstairs to one of the guest waiting rooms where there were a lot of people. Most people were drinking tea and chatting. A few were playing cards. After awhile, all of us went back downstairs and sat down in the main dining area of the restaurant for the beginning of the wedding party. 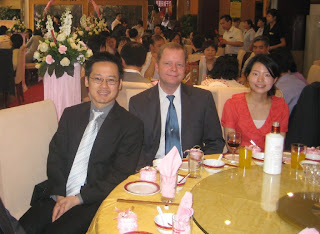 This wedding had a little ceremony at the beginning, but compared to most western weddings it was very short. At the beginning of the party the father of the bride escorts the bride from upstairs to the entrance to the dining area where there was a leafy/flowery arch, and from there the groom escorts the bride to the stage. Along the way there will little flower stands, and I thought they had candles on them when I first saw them, but they turned out to be sparklers which are lit as the couple goes by. The couple posed for pictures on the stage for a little bit and then they lit a candle in the middle of a heart-shaped wreath that had little candles around it. Then a few people came up to speak and offer the couple their best wishes. One was a manager at IBM (seems you really can't do anything without your reporting manager's approval. Haha!) and he read something. I wish I knew what it was, but it was all in Chinese. Then the father of the bride spoke for a little bit. After that the groom gave the bride a ring. 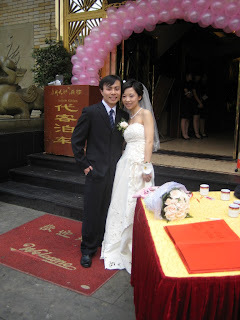 Wedding rings are not traditional here in China, but a lot of the younger couples are giving rings at weddings now. Then came time for the groom to kiss the bride, and there were some big sparklers that went off at that time. It was a pretty quick kiss, and I missed getting a picture of it. Then the wedding couple left the dining area, and changed into some more casual and traditional clothing, and the rest of us started lunch. 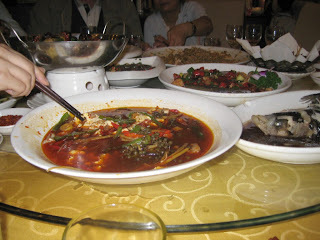 We had lots of great Sichuan food. There was one dish that I had never had before and it was pretty good... It was made up of sliced up little potatoes, which were placed in a small mound. On top of those they placed several beef ribs and on top of those they had some shredded bread crumbs. This was all cooked together, and then before bringing it to the table someone strips all of the meat off the bones, discards the bones, and mixes it all together. While we ate, the bride and groom came around each table and drank a toast with everyone pretty much individually. The bride drank orange drink and the groom drank 白酒 (often called diesel fuel by us foreigners), and he did a great job of not appearing drunk by the time all of the toasts were done. I had red wine which was pretty good. After lunch the party was over and everyone headed home. Everyone had a great time! The first place was an Irish pub that is in the Shangri-la Hotel called Mooney's Pub. This is a new place and has only been open a few months. I had the Shepherd's Pie and some Kilkenny lager... They were both really good. 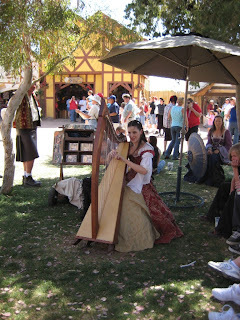 They also had a duet from Scotland who played some Irish and Scottish songs. Mooney's has a nice atmosphere and it's not too crowded. The only down side is it is in a hotel, so the prices are a little high. Last night I took Reese to a Papa John's pizza place that just opened at a new shopping center near where I live called Wanda Plaza. As far as I know there are a few Papa john's in Beijing and Shanghai, but this is the only one in ChengDu. All of the Papa John's that I have been to in the U.S. were pick-up or delivery only, but the one here in ChengDu is a restaurant where you can eat your meal there. We had a garden salad, some chicken wings, and a large thin-crust pizza that was a Super Papa's (all ingredients) on one half and a Texas Heat (beef and peppers) on the other half. The salad was ok. The wings were a little greasy, but very tasty. The pizza was very good. While wondering around the neighborhood where I live I found this nice clean little noodle place. I do not remember the name of it. I tried the dandan mian; which is a bowl of noodles with some spicy ground pork, some spicy ground peanut and sesame sauce, and a few green vegetables (usually cucumber, lettuce or cabbage). Although it was not the best dandan mian I've ever had, it was the best dandan mian I've had in ChengDu. The price was really good too... 5.5 Yuan (about 80 cents) for a medium size bowl. I'm looking forward to trying out other noodle dishes there too. I also discovered a place near where I live called Liao's Bon Bon Chicken. This is a chain restaurant, and I've only seen it in Sichuan province. I haven't eaten here yet, but want to try it. Some of my friends told me it's really good. Maybe next weekend. A few weeks ago I got an email from my office that I had a bunch of deferred vacation that I needed to use up. 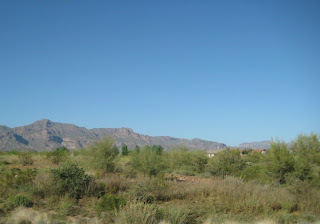 At about the same time I was telling some friends in Phoenix that I was a little homesick for the US sometimes and they said I should come visit, so I quickly put together a trip to Arizona. I got my plane tickets, hotel reservations, and car rental all done online. The flights to and from Phoenix were a bit long (over 20 hours each) for just five or six days, but it was a fantastic trip. I took off from ChengDu last Wednesday and then headed back on Monday morning. The weather in Arizona was hot and dry, and it felt really nice compared to the wet cool weather we had been having in ChengDu. 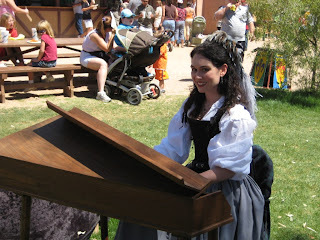 While I was in Phoenix I got to eat a bunch of great food; visit the Arizona Renaissance Festival; and hang out with my friends Mike and Jean, and their daughters Angela and Alexandra. My first night there we went to a steak house and I had a really good thick ribeye steak and a salad with bleu cheese dressing. I really needed that! All of my meals were really good and I ate a lot of things that I really missed from home; like breakfasts with eggs, hash browns, chorizo sausage, etc... We also had some really good pork loin that Mike cooked on the grill one night. Of course, I had to go to Hooters for some spicy wings one day. 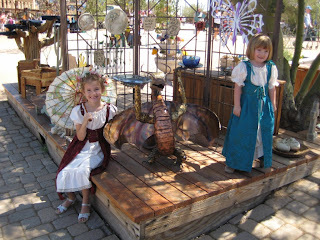 One day we went to the Arizona Renaissance Festival. 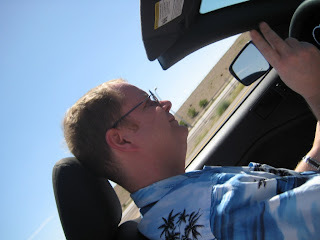 It was a lot of fun, but I got way too much sun and I was really dragging the next day. 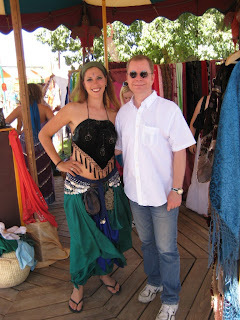 That was ok since it was Sunday and it was a nice relaxing day hanging out with Mike and Jean and playing Everquest II. A big thanks to Mike, Jean, Angela, and Alexandra for a wonderful time! The flight back to China was kind of weird since all of the problems were at the airports in the US and I had no problems in China. At the airport in Phoenix they put in these e-ticket scanners that actually took much longer to use than how things were done before. It took almost an hour just to check into my flight, and some people actually missed the flight since the new system was so slow. Then there was a problem with the PA system on the airplane, so we ended up leaving late and I almost missed my flight from San Francisco to Beijing. When we got to Beijing we arrived at one of the new terminals, and it was really nice. Came back to work today. So far my jet lag isn't too bad. Luckily Friday is a holiday (Qingming Festival), so I have a three day weekend to recover if my jet lag gets worse.